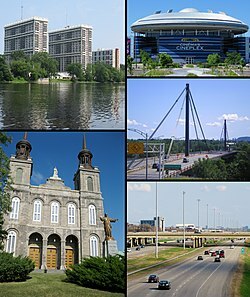 Laval (/ləˈvæl/; French pronunciation: [laval] ( listen)) is a Canadian city in southwestern Quebec, north of Montreal. 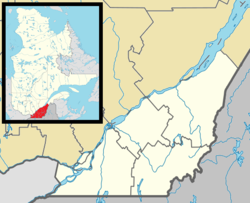 It forms its own administrative region of Quebec. It is the largest suburb of Montreal, the third largest municipality in the province of Quebec, and the thirteenth largest city in Canada with a population of 422,993 in 2016. Laval constitutes the 13th region of the 17 administrative regions of Quebec as well as a territory equivalent to a regional county municipality (TE) and census division (CD) with geographical code 65. It also constitutes the judicial district of Laval. The first European Settlers in Laval were Jesuits in 1636 when they were granted a seigneury there. Agriculture first appeared in Laval in 1670. In 1675, François de Montmorency-Laval gained control of the seigneury. In 1702 a parish municipality was founded, and dedicated to Saint-François de Sales (not to be confused with the modern-day Saint-François-de-Sales in Saguenay–Lac-Saint-Jean). To deal with problems caused by urbanization, amalgamations occurred; L'Abord-à-Plouffe amalgamated with Renaud and Saint-Martin creating the city of Chomedey in 1961. The amalgamation turned out to be so successful for the municipalities involved that the Quebec government decided to amalgamate the whole island into a single city of Laval in 1965; however the passage of amalgamation bill was not without controversy. Laval was named after the first owner of Île Jésus, François de Montmorency-Laval, the first Roman Catholic Bishop of Quebec. At the time, Laval had a population of 170,000. Laval became a Regional County Municipality in 1980. Prior to that, it was the County of Laval. Laval is bordered on the south by Montreal across the Rivière des Prairies, on the north by Les Moulins Regional County Municipality and by Thérèse-De Blainville Regional County Municipality and on the west by Deux-Montagnes Regional County Municipality across the Rivière des Mille Îles. According to the 2011 Census of Canada, the population of Laval was an estimated 401,553, an 8.9 percent increase from the earlier census in 2006. Women constitute 51.5% of the total population. Children under 14 years of age total 17.3%, while those of retirement age (65 years of age and older) number 15.6% resulting in a median age of 40.9 years. Laval is linguistically diverse. The 2011 census found that French was the only mother tongue of 60.8% of the population, and was spoken most often at home by 65.2% of residents. The next most common mother tongues were English (7.0%), Arabic (5.6%), Italian (4.2%), Greek (3.5%), Spanish (2.9%), Armenian (1.7%), Creoles (1.6%), Romanian (1.3%) and Portuguese (1.3%). The city's longtime mayor, Gilles Vaillancourt, resigned on 9 November 2012, following allegations of corruption made against him in hearings of the provincial Charbonneau Commission. City councillor Basile Angelopoulos served as acting mayor until Alexandre Duplessis was selected in a council vote on 23 November. Duplessis, in turn, stepped down after just seven months in office after facing allegations of being implicated in a prostitution investigation; he was succeeded by city councillor Martine Beaugrand until the city's current mayor, Marc Demers, was elected in the 2013 municipal election. On 3 June 2013, the provincial government of Pauline Marois placed the city under trusteeship due to the ongoing corruption scandal affecting the city. Florent Gagné, a former head of the Sûreté du Québec, will serve as the city's head trustee, with responsibility for reviewing and approving or rejecting all decisions made by city council. Municipal Affairs Minister Sylvain Gaudreault said that Laval's Mayor Alexandre Duplessis and his council will continue to serve, but council decisions must be approved by the trustees. Duplessis, in turn, resigned as mayor on 28 June 2013, after being implicated in a separate prostitution allegation. The letters of the Laval signature are related one to the other to point out the merger of the 14 municipalities of Jesus island in 1965. Politically, Laval has been historically a battleground area between the Quebec separatist parties (the Bloc Québécois federally and the Parti Québécois provincially) and the federalist parties (various parties federally and the Quebec Liberal Party provincially). The only exception is Chomedey in the south, which voted overwhelmingly to not separate in the 1995 Quebec referendum. The other parts of Laval have drifted to the provincial Liberals in recent years. While the PQ held every Laval riding except Chomedey during their second stint in government between 1994 and 2003, the Liberals won every Laval riding in 2003, 2007, and 2008. During the 2012 election, the PQ saw some gains in Laval when they captured 2 seats, but both returned to the Liberal fold during the 2014 election. Laval's diverse economy is centred around the technology, pharmaceutical, industrial and retail sectors. It has many pharmaceutical laboratories but also stone quarries and a persistent agricultural sector. Long seen as a bedroom community, Laval has diversified its economy, especially in the retail sector, developing numerous shopping malls, warehouses and various retail stores. Laval has four different industrial parks. The second, the Autoroute 25 Industrial Park is at the crossroads of the metropolitan road network. Inaugurated in 2001, this new industrial municipal space has been a tremendous success, boasting an 80% occupancy rate. Laval is studying the possibility of expanding this park in the next few years. The fourth industrial park, the Laval Science and High Technology Park is located along Rivière des Prairies and Autoroute 15. It is an internationally renowned science campus that houses the Biotech City and the Information Technology Development Centre (ITDC). The Laval Science and High Technology Park is a beacon of the metropolitan economy, in an environment befitting the best technopolises in the world. Nearly 500,000 square metres (5,400,000 sq ft) of space are available for development. The Biotech City spans the entire territory of the Laval Science and High Technology Park and is a unique concept in Canada in that its residents comprise both universities and companies. Alimentation Couche-Tard has its headquarters in Laval. Laval was the host-city of the "Jeux du Québec" held in summer 1991 and of the Canadian Hockey League's 1994 Memorial Cup. On 11 July 2016 it was announced that Laval would become home to the Montreal Canadiens American Hockey League affiliate the Laval Rocket, starting in the 2017–2018 season. The Papineau-Leblanc Bridge links Laval to the Ahuntsic-Cartierville borough of Montreal. 2000 Boulevard du Souvenir overpass collapse: On 18 June 2000, during renovations to the Souvenir Boulevard overpass over Highway 15, the southern section collapsed onto the highway, causing the death of one person. De la Concorde Overpass collapse: On 30 September 2006, the De la Concorde overpass over Autoroute 19 suddenly collapsed killing five people. A train arriving at Montmorency Station in the Montreal Metro. In April 2007, the Montreal Metro was extended to Laval with three stations. The long-awaited stations were begun in 2003 and completed in April 2007, two months ahead of the revised schedule, at a cost of C$803 million, funded entirely by the Quebec government. The stations are Cartier, De La Concorde, and Montmorency. The arrival of the Metro in Laval was long-awaited as it was first promised in the 1960s. Former mayor, Gilles Vaillancourt, announced his wish to loop the Orange line from Montmorency to Côte-Vertu stations with the addition of six new stations (three in Laval and another three in Montreal). He proposed that Transports Quebec, the provincial transport department, set aside C$100 million annually to fund the project, which was expected to cost upwards of $1.5 billion. The Réseau de transport métropolitain (RTM) operates two commuter train lines on the island. The Deux-Montagnes and Saint-Jérôme lines connect Laval to downtown Montreal in as little as 30 minutes. Including De la Concorde, there are currently five train stations. On the Deux-Montagnes line, there are two stops in Laval, Île-Bigras and Sainte-Dorothée. On the Saint-Jérôme line there are three stations in Laval, De la Concorde, Vimont and Sainte-Rose. The Société de transport de Laval (STL) provides local bus service in Laval. The STL's network consists of 35 regular lines, two rush hour lines, two trainbus lines, three express lines, one community circuit and several taxi lines. There are reserved lanes for buses and taxis on Chomedey Blvd between Le Carrefour Blvd and the Des Prairies River (Lachapelle Bridge) and beyond as well as along boulevard des Laurentides between rue Proulx and boulevard Cartier (the reserved lane, in this case for buses only, continues onto the Pont Viau bridge into Montreal until the Terminus Laval at the Henri-Bourassa Metro station). Most buses that use the reserved lane end their journey at the Cartier Metro station. The AMT and the City of Laval have developed reserved bus and taxi lanes on Notre-Dame Boulevard between Vincent Massey Street and Place Alton-Goldbloom and another on De la Concorde Blvd between De l'Avenir and Laval Blvds, as well as between Ampere Ave and Roanne St. These reserved lanes (Notre-Dame and De la Concorde are the same boulevard but change name where they meet under Autoroute 15) opened shortly after 31 October 2007. The Laval campus of the Université de Montréal. The city has two separate school boards serving Laval: the Commission scolaire de Laval for French-speaking students and the Sir Wilfrid Laurier School Board for English-speaking students. There is one community English-language high school in the city: Laval Senior Academy, created on July 1, 2015 by the merger of Laval Liberty High School and Laurier Senior High School. Laval has two radio stations on its territory: CJLV 1570 AM "Radio Mieux-être" (formerly CFAV) and CFGL 105.7 FM "Rythme FM". One television community channel operates on Laval's territory, Télévision régionale de Laval, as part of Videotron cable's VOX network. It also shares several economic and cultural cooperation agreements with cities such as Markham, Ontario; Ribeira Grande, The Azores; Klagenfurt, Austria; Heidelberg, Germany; San Salvador, El Salvador; Manila, Philippines; and Pedro Aguirre Cerda, Chile. ^ a b c d e "(Code 2465005) Census Profile". 2011 census. Statistics Canada. 2012. ^ Lavallois – Wiktionary. En.wiktionary.org. Retrieved on 2013-07-12. ^ Seale, Lewis (7 August 1965). "Upper house gives in, accepts bill changes". The Montreal Gazette. Postmedia Network. p. 1. Retrieved 1 April 2013. ^ "History and Heritage". Laval portal website. Retrieved 8 November 2006. ^ Environment Canada—Canadian Climate Normals 1971–2000. Retrieved 1 March 2017. ^ "Évolution démographique des 10 principales villes du Québec (sur la base de 2006) selon leur limites territoriales actuelles1, Recensements du Canada de 1871 à 2006". Stat.gouv.qc.ca. Archived from the original on 6 October 2013. Retrieved 2 January 2012. ^ "Laval, Quebec – Ethnic origins, 2006 counts, for census divisions – 20% sample data". Ethnocultural Portrait of Canada, Canada 2006 Census. Statistics Canada. 6 October 2010. Retrieved 20 August 2011. ^ "Laval mayor resigns amid Montreal corruption scandal". Toronto Star, 9 November 2012. ^ "Laval searches for interim mayor". CBC News, 13 November 2012. ^ "Alexandre Duplessis elected new interim mayor of Laval". The Gazette, 23 November 2012. ^ a b "Laval mayor Alexandre Duplessis resigns". The Gazette, 28 June 2013. ^ a b "Quebec premier calls Laval trusteeship 'terrible, disheartening, sad'". The Globe and Mail, 3 June 2013. ^ Quebec orders Laval under trusteeship. CBC News, 3 June 2013. ^ "Flags of the World". Flags of the World website. Retrieved 16 July 2005. ^ "Laval Technopole website". Laval Technopole website. Archived from the original on 29 September 2007. Retrieved 2 March 2007. ^ "A new neighbor". NHL.com. ^ "Overpass dismantled, highway re-opened". CBC News website. 24 June 2000. Retrieved 8 March 2007. ^ "Overpass collapse shuts down Quebec highway". CBC News website. Archived from the original on 21 August 2007. Retrieved 10 March 2007. ^ "Overpass Collapses Near Montreal; People Trapped Feared Dead". Fox News Website. 30 September 2006. Retrieved 8 November 2006. ^ CA (22 July 2007). "Montréal a bien d'autres priorités – Transport en commun". Courrier Laval. Archived from the original on 27 May 2012. Retrieved 2 January 2012. ^ "About Us." Laval Senior Academy. Retrieved on September 4, 2017. ^ "Tourisme Laval". Tourisme Laval website. Retrieved 26 July 2008. ^ Fasciano, John (4 September 2009). "Laval: 25 ans d'amitié par-delà l'Atlantique". Courrier Laval. Archived from the original on 20 January 2013. Retrieved 9 September 2011. Wikimedia Commons has media related to Laval, Quebec. Interactive map of Laval from the official website Shows both the borders and names of the 14 former municipalities (purple) and the borders only of the current 6 sectors (maroon), tick off both boxes beside "Limite administrative". This page was last edited on 3 February 2019, at 04:38 (UTC).